What’s the key to saving time and money on drafting projects? That’s a question we continue to ask ourselves to make sure we’re staying well ahead of the curve. And we’ve come up with several answers over the years. #1. The first way is to exceed client expectations. One way we do this is through connections with key glass and glazing industry resources. These relationships save our clients the effort of having the find and build professional connections themselves. They make it a lot easier to get your project off the ground quickly. We have several project engineering resources, manufacture contacts, and thermal experts that we can turn too. These partnerships are a key part of our competitive advantage. #2. 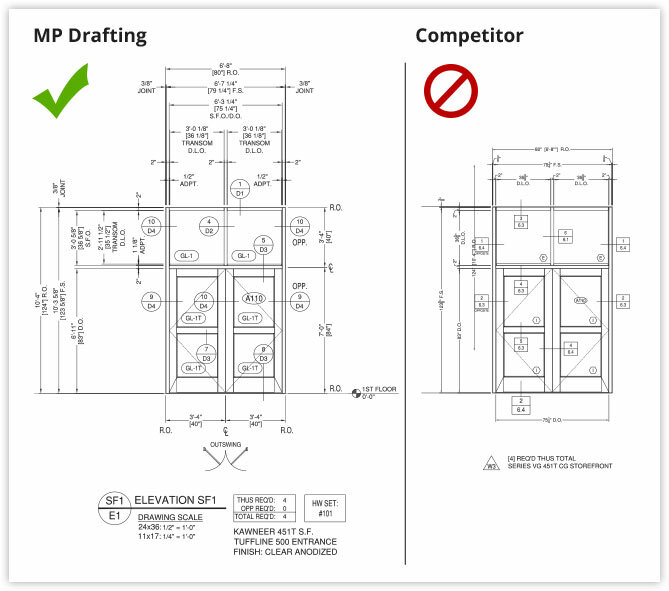 Another competitive advantage is the level of detail we provide in our drawings. #3. Finally, we focus 100% on producing exceptional drawings, so you can focus 100% on managing your project. Our professionals have accumulated a lot of experience by drafting every day. This expertise helps streamline the whole production and review process. But it also means we can spend time creating quality drawings that meet or exceed your internal drawing standards. We often go beyond the professional quality standard you might expect from us. We can provide details that would otherwise be too time consuming for you to do in-house. And the result is high quality drawings that lead to faster (and more precise) fabrication/construction. The net benefit to you, again, is a high-quality drafting service that helps your projects move along faster while staying within your budget.